People in Hawaii and Florida brace for severe weather heading their way. Hawaii-bound Hurricane Madeline was downgraded to a tropical storm by the National Weather Service Wednesday, as its winds decreased to 70 mph, but forecasters reiterated that residents should remain indoors and prepare for heavy rain and strong winds. The Big Island and Maui County were under tropical storm warnings. "It doesn't matter if it's a strong tropical storm or a category 1 hurricane," Eric Lau, a meteorologist with the weather service told The AP. "If you have 70 mph winds verses 75 mph winds, it's still a strong storm, so residents still need to be prepared." 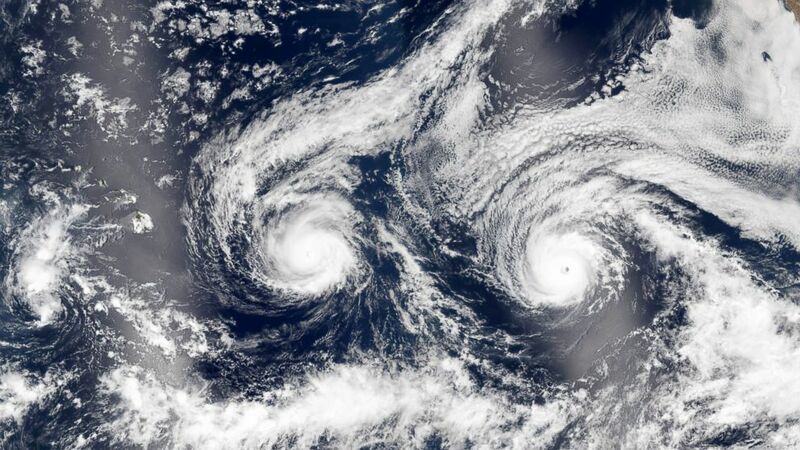 (NASA EARTH OBSERVATORY/EPA) A handout image released by NASA Earth Observatory on Aug. 31, 2016 shows a satellite image of hurricanes Madeline (L) and Lester (R) over the Pacific Sea near Hawaii. Hawaii Island public schools will be closed Wednesday and Thursday because of Madeline, according to the state's Department of Education. Also expecting to batter Hawaii is Hurricane Lester, which was about 1,000 miles from Hawaii Wednesday and expected to drop to a tropical storm by Sunday. Lester is expected to bring heavy rain, gusty winds and bigger surf. Some of the infrastructure in Hawaii is not equipped to handle a strong storm. One man on the Big Island attached a strap to his home in an attempt to tie down the roof. He said the house is old and he's not confident that the roof will hold. Over in the Atlantic, the National Hurricane Center said Tropical Storm Hermine had formed in the Gulf of Mexico and was centered about 350 miles from Tampa, Florida. It was expected to pick up speed and approach the northwest Florida coast Thursday night. A warning was dropped about a tropical depression that had been moving toward North Carolina. Roadways have turned into rivers on the Sunshine State's outer bands, stalling cars and tying up traffic. Some families and oil rigs on Florida's Gulf Coast have begun to evacuate, and the city of Cedar Key is expecting up to 5 feet of storm surge. A hurricane watch is in effect for the Anclote River to Indian Pass in Florida, and a tropical storm warning is in effect for the Anclote River to Florida's Walton-Bay county line, according to the National Hurricane Center. Tornadoes are possible late tonight through Thursday morning across central Florida, the National Hurricane Center said. A storm surge can cause normally dry areas to be flooded by rising waters over the next two days along Florida's Gulf Coast. Another tropical depression is moving slowly northeastward away from the North Carolina coast at about 5 mph. It has maximum sustained winds of 35 mph, but there are no coastal watches or warnings in effect. Strengthening is still possible, and the depression could become a tropical storm later today, but it is expected to continue moving northeast, according to the National Hurricane Center.